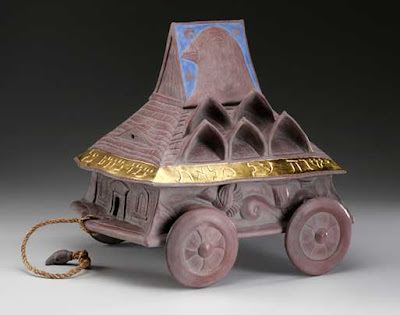 To mark the 100th anniversary of Congregation Beth El, the Bennington Museum has mounted an astonishing installation, Revisiting Our Traditions – Illuminating Our Times by sculptor and ceramicist Emmett Leader, a third-generation Vermonter whose family also celebrates this year the centennial of its arrival in the Green Mountains. Leader’s project links the village cultures of the Eastern European Jewish shtetl and the communities of rural New England where Jews had to remake and reinvent themselves in a strange land. He has borrowed from many sources, including gravestones from shtetl cemeteries, a 14th century Haggadah (Passover prayer book) and Biblical texts to fashion a family history in a stylized visual folk-language. This vernacular conveys both nostalgia for vanished folkways and continuity with ancient values. 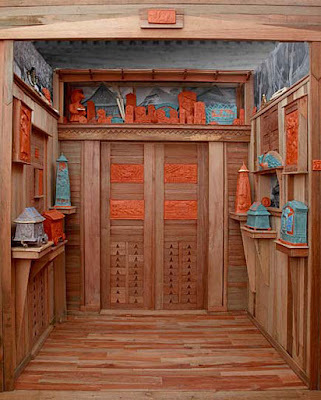 Scores of terra cotta sculptures and bas-relief plaques treated with terra sigillata (sealed earth, a light, buffed glaze that produces a silken matte like healthy skin) are assembled with found and crafted objects, family mementoes, dried vegetation and other materials in three large mise-en-scènes (a Russian synagogue, a sukkah, a dovecote) crafted of salvaged mahogany and other woods or in wall-mounted wooden panels that might be windows or doors. Muted colors -- ruddy terra cotta, occasionally offset by blue or gold glaze, against tawny wood -- impart a sepia glow. 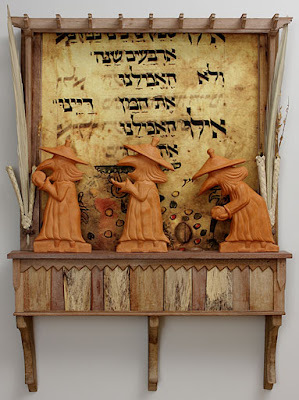 Rabbi Isaac Leader, the artist’s grandfather, was born in the Ukrainian shtetl of Slonim, whose village synagogue is recreated in the diorama Slonim Revisted. Here, in a broom-closet space, seemingly more capacious than it measures and furnished with photos, sculptures, plaques and ritual objects, Leader introduces the motifs that knit together the components of his project: the tzeddakah box, into which Jews drop charitable offerings; the autumn harvest festival of Sukkot (Tabernacles) and the corresponding spring planting festival of Pesach (Passover), during which Jews recount the exodus and rebirth of Israel; the toothed crenelation that is the synagogue’s distinguishing design element; and, most significantly, an evocative and complex avian symbology. Inspired by the medieval illuminators of the Bird’s-Head Haggadah, who dodged the biblical prohibition against graven images, Leader depicts Jews with the heads of birds (and big, Jewish beaks) and dresses them in the robes and distinguishing conical hats of the Middle Ages. Whether engaged in timeless prayer or driving a tractor, they are identical, signifying a magical continuity that threads together the fates of Jews in Bennington, Slonim and ancient Israel. In the bas-relief triptych My Grandfather’s Rabbinate, Leader illustrates the story (told in an accompanying poem by his mother, Miriam, from the recollections of his father, Herb) of how his (bird-faced) grandfather, traveling by horse-cart among Bennington’s Jewish households, received his pay in chickens (fellow birds? ), realized there was more money in livestock and land than in teaching the torah and abandoned his rabbinate. Ironically, the third panel shows the rabbi horseless and tethered to his own cart, receiving what might be a coin from a hand descending out of heaven, a reference here and elsewhere in the exhibition to the manna that sustained the Israelites during the exodus. Behind him, like an enormous sun hovering at the horizon, appears the form of a gigantic dove. The dove recurs frequently, serving as a metaphor of both the divine and the human spirit that longs for the holy. Leader has inscribed on the plaques passages in Hebrew, many from the Song of Songs, notably: “His eyes are as doves by the waters of the brook,” (5:12), which, allegorically, is interpreted to extol the love of the torah. Dovecotes abound. They appear in the synagogue, in the bas relief illustrations and in a barrel-like diorama entitled Dovecote that also displays photographs and mementoes of the Leader family inside its staved rotunda. The triangular form of the dovecote window is even echoed in the tzeddakah boxes – whose roofs are topped with peacocks, a common symbol of paradise. In the lexicon of Leader’s symbology, dovecotes allude to home, to a place of repose and sanctuary; they resemble another pictorial element, the ark that houses the scrolls of the torah, and they also carry an agricultural reference: dovecotes are often seen atop barns in Vermont. 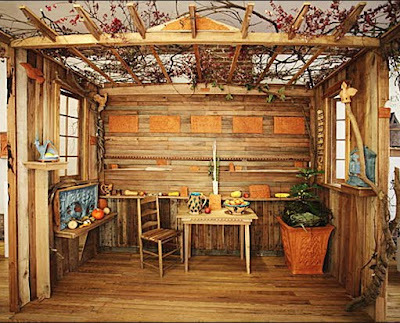 Leader was raised on a farm in Andover, and the third of the installation’s wooden dioramas is Sukkah, a makeshift tabernacle recalling the tents of the wandering Israelites that Jews erect adjacent to their homes during the festival of Sukkot and decorate with the fruits of the harvest. There, on a shelf, appears the model of a bird-man on a tractor: Leader’s father driving his Allis Chalmers. The intermingling of earthly occupation, family history and spiritual aspiration is complete. Revisiting Our Traditions – Illuminating Our Times bears comparison to Judy Chicago’s The Dinner Party; every detail is beautifully made, and there is a proliferation (hardly hinted at here) that rewards repeated attention. The dioramas might be museum cases or Renaissance “cabinets of wonder”; the primitivist stylization and archaic figuration adduce not only medieval sources but Egyptian hieroglyphics and the weird surrealism of the comic artist R. Crumb. The effect is both playful and mysterious. That Leader can integrate and harmonize such multifarious resonances so effortlessly is a remarkable accomplishment. This reviewer’s only reservation concerns the lack of an explanatory apparatus. For those unacquainted with Jewish tradition or the Hebrew language, the installation might seem more baffling than engaging. 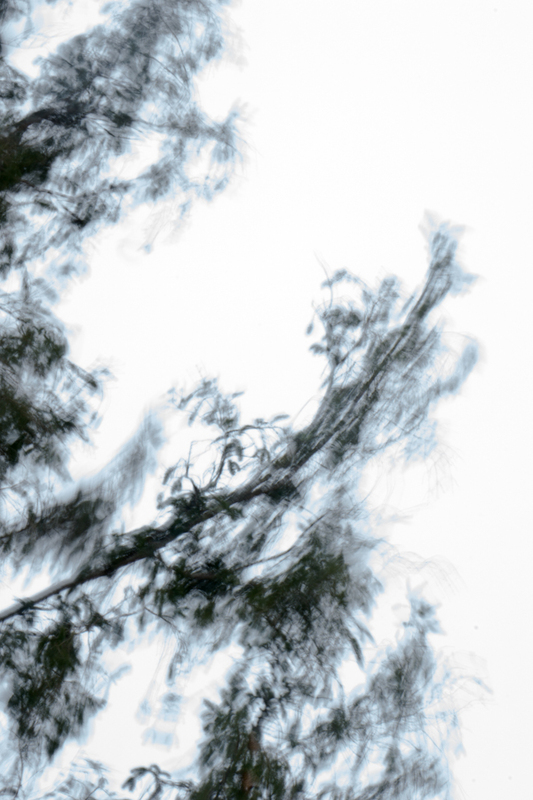 A work so naturally mysterious shouldn’t mystify.